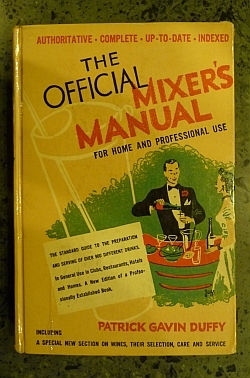 It has seemed to us that since the return of legal liquor, there has been a very genuine and widely felt need for a standard book on drinks, a book that could be relied on in any bibulous contingency both by the ambitious amateur and by the seasoned professional bartender. It is not only that once again good liquor is available, but also various ingredients that have been merely myth and legend to the younger generation of celebrants, such as Chartreuse or Amer Picon, have returned to the enjoyment of that respect and appreciation which was formerly accorded to them by an unshackled public. Chartreuse is an herbal liqueur produced by Carthusian monks in the French Alps. With almost 400 years of history, Chartreuse is one of the oldest and most mysterious spirits still available. Only three monks from the order know the secret recipe, each hold one third of that recipe and all have taken a vow of silence, so the secret recipe is kept safely. The liqueur was originally created as an "Elixir of Long Life" in 1605 by Peres Chartreux. The formula was perfected over the years and by 1737 the liqueur was released to the world in a form that is close to what we drink today. Secret recipe held in three parts by specially trained monks with vows of silence?! I love it when I discover that things like that exist in real life. And this is only what I learned after reading the first paragraph of this book. It's also full of recipes that I've never remotely heard of before -- including plenty of "virgin" or non-alcoholic recipes, with names like "Temperance Punch". I can't even deal with how amazing this book is, and it's $6.50. Get it before the local hipsters do, folks. Unless you are a local hipster, in which case, you're looking to outrace your brethren. The Robie House on the University of Chicago campus is considered one of the most important buildings in American architecture. It was created by Frank Lloyd Wright for his client Frederick C. Robie, a forward-thinking businessman. Designed in Wright's Oak Park studio in 1908 and completed in 1910, the building is both a masterpiece of the Prairie style and renowned as a forerunner of modernism in architecture. Tours of the site offer both a first-hand experience of its amazingly contemporary spaces and the current restoration work that is returning the house to its original appearance. I've taken the tour. It's great. 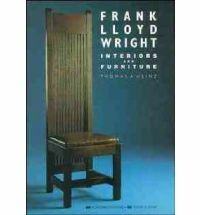 Go do it and then come look at our Wright books! 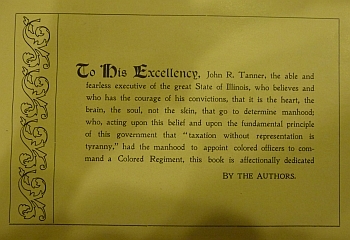 To His Excellency, John R. Tanner, the able and fearless executive of the great State of Illinois, who believes and who has the courage of his convictions, that it is the heart, the brain, the soul, not the skin, that go to determine manhood; who, acting upon this belief and upon the fundamental principle of this government that "taxation without representation is tyranny", had the manhood to appoint colored officers to command a Colored Regiment, this book is affectionately dedicated by the authors. 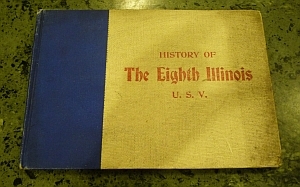 It's very rare to have a book like this in such good condition and available to the general public, which is why we are asking $395.00 for it. Help us remember the history of more than one epic battle -- the physical one, and the one for civil rights. February is Black History Month, gentle readers, so I'm sure that we will have more where that came from! You can look forward to it in our next blog entry. One of my favorite months: Black History Month!